NEW YORK (AP) — Rihanna, Amal Clooney and Donatella Versace will join Vogue editor Anna Wintour in chairing next year's star-studded Met Gala, which will take on a religious theme: "Fashion and the Catholic Imagination." 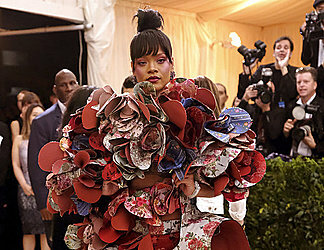 The Costume Institute at the Metropolitan Museum of Art announced the news on Wednesday, explaining that the annual spring exhibit and the May 7 gala launching it will examine "fashion's ongoing engagement with the devotional practices and traditions of Catholicism," combining works of fashion with works of religious art, including approximately 50 ecclesiastical masterworks on loan from the Sistine Chapel sacristy at the Vatican. Those items, which will be on view in the Anna Wintour Costume Center galleries, will include papal vestments and accessories, such as rings and tiaras, from the 18th to the early 21st century, the museum said. The items encompass more than 15 papacies. "Fashion and religion have long been intertwined, mutually inspiring and informing one another," Andrew Bolton, head curator of the institute, said in a statement. "Although this relationship has been complex and sometimes contested, it has produced some of the most inventive and innovative creations in the history of fashion." The 150 fashion ensembles will come from a slew of designers, including Cristobal Balenciaga, Coco Chanel, John Galliano, Karl Lagerfeld, Givenchy, Christian Lacroix, Thierry Mugler, Raf Simons, Thom Browne and Gianni and Donatella Versace, among many others. The exhibition, which will run May 10 through Oct. 8, is a collaboration between the Costume Institute and the Department of Medieval Art and The Cloisters.